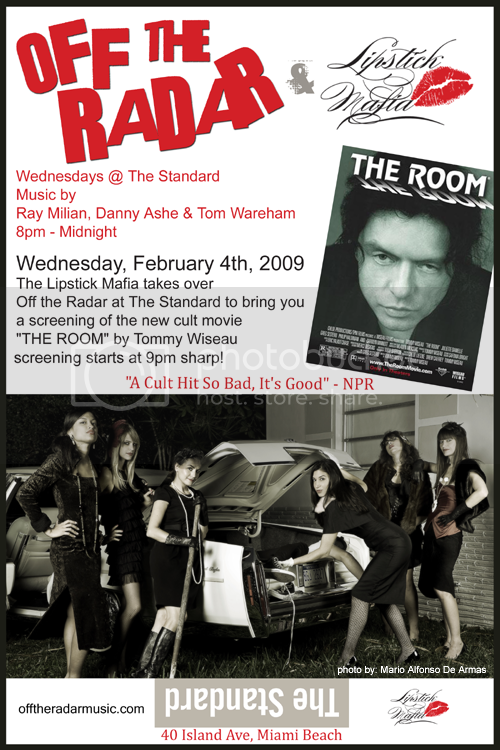 This Wednesday Off the Radar & Lipstick Mafia Present a Screening of Cult Movie "The Room" by Tommy Wiseau! "The Room" (www.theroommovie.com) is being touted as The Modern Rocky Horror Picture Show and has been called by NPR "A Cult Hit So Bad, It's Good"
It might be the most unintentionally hilarious film of all time and the LM is bringing this Los Angeles cult phenomenon to MIA. The film has a HUGE celebrity following, and stars are even doing screenings at their homes: "Role Models star Paul Rudd and Arrested Development's David Cross are both fans, as is Jonah Hill, who uses a still from the movie as his MySpace photograph. Heroes star Kristen Bell hosts Room-viewing parties at her house and last year attended the film's monthly Laemmle screening with Rudd, Hill, and Shaun of the Dead director Edgar Wright. ''There is a magic about that film that is indescribable,'' she says." -Ent. Doors at 8pm. Early arrival is encouraged for best seating. Screening starts at 9pm sharp in the Standard lobby. Off the Radar music from 8-12 in the Lido Bar by Ray Milian, Danny Ashe & Tom Wareham. $5 beer, $6 wine, $8 cocktail specials all night. Valet for $7 with bar validation. Carpooling, bike or taxi is encouraged. *** After Party @ Purdy Lounge w/Joshy Josh & Off the Radar DJ's! !